THANK YOU to everyone who donated either their time or finances to this fitting tribute. There is a tree coming soon. Hope everyone enjoyed the DVDs. It is such a beautiful spot. Please go and enjoy the solace of this sacred ground and reminisce of our gone yet not forgotten funky brother, father and son. 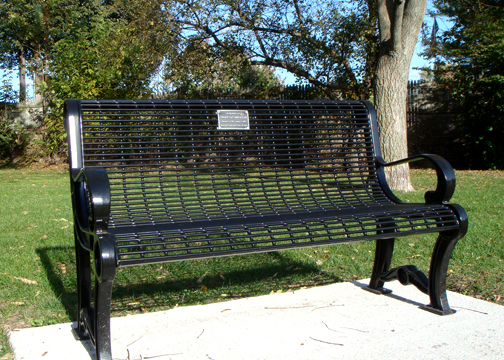 The bench is located in St. Louis Park, on St. Louis Street, south off Marshall, about 2 blocks away from his studio. The AJ Tribute DVD is available (see Contact page). 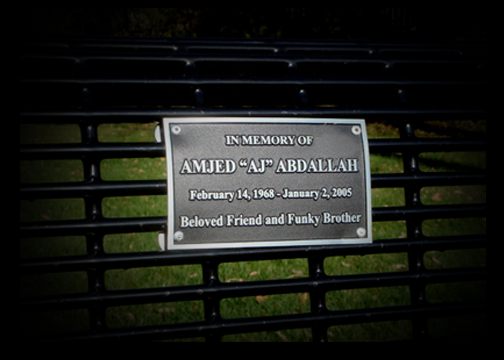 The tree will be in a Ferndale public park with a bench and a plaque honoring the memory of our funky friend. Please donate what you can here or at any Howling Diablos show. Click the “Donate” button on the right to contribute to this great cause. Thank you so much! I met AJ in the early 90s gigging with Pat. He would come out and sit in with us. I did a recording with AJ also. 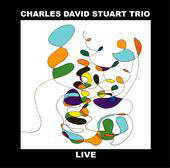 I also have a new CD out next week — “Charles David Stuart Trio Live with Duffy King, James Simonson & Mark Byerly”. This was recorded at Memphis Smoke BET 2004 & 2007. 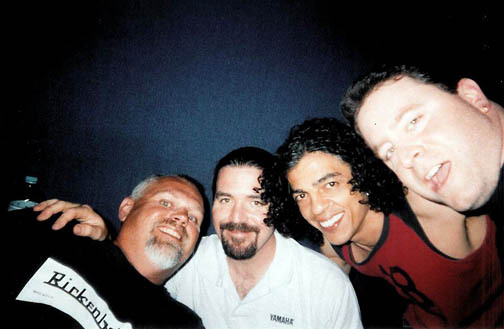 There is a tune on the CD called “AJ” dedicated to him (an extended drum solo). Kevin Floyd, Pat Brennan, AJ, Charle David Stuart (photo by left hand!) This is a great photo! The recording session was with/for Pat Brennan at Soup Can Studios. 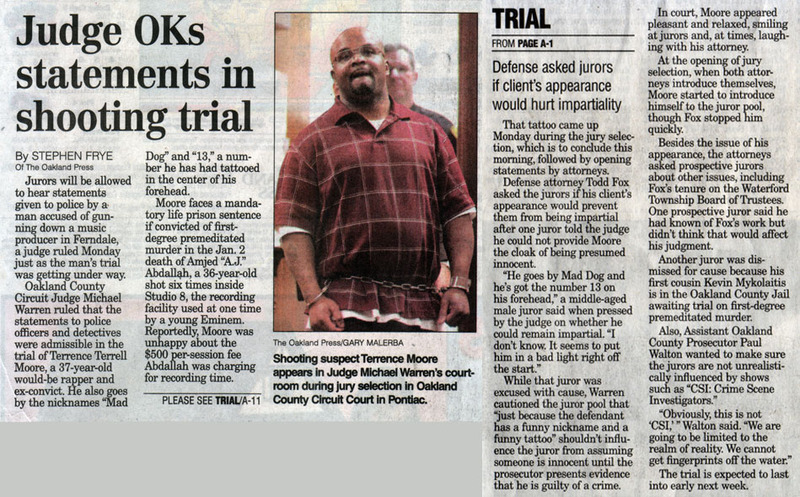 PONTIAC – Up until the moment that Terrence Moore, 37, was ushered out of an Oakland County courtroom to begin a life sentence for murder, he denied responsibility for the crime. 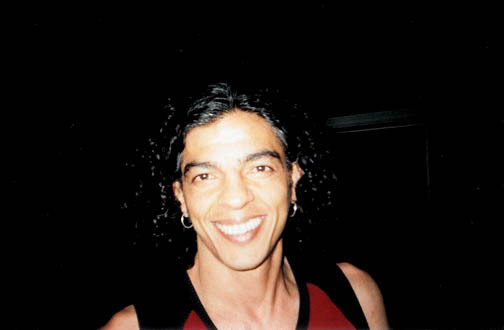 Amjed “A.J.” Abdallah became a well known performer in the Arabic world, but when he moved to the United States at age 20 from Kuwait he had to start all over, his ex-wife recalled as his killer — Terrence Terrell Moore — was sentenced to life in prison. A jury needed just less than four hours to convict an aspiring rapper of first-degree murder in the death of a popular and well-liked recording artist in his Ferndale studio. Jurors saw it Friday in the accused killer’s own handwriting. 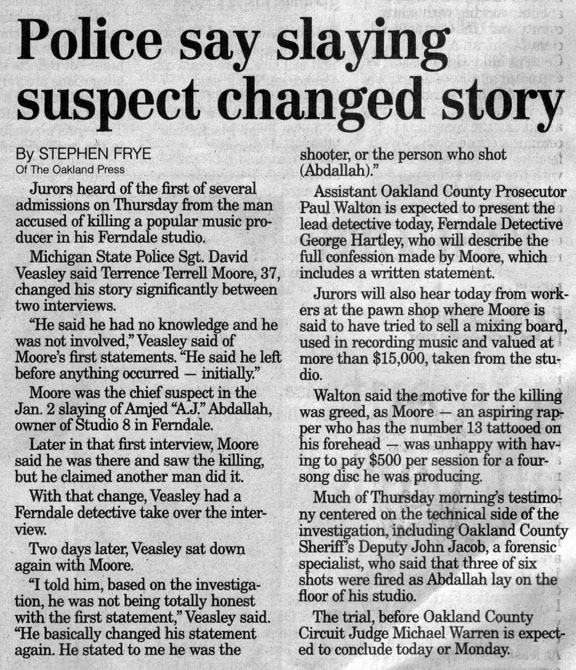 “I CONFESS TO THIS KILLING” was written in large letters at the bottom of a Ferndale police witness statement sheet, underneath a paragraph written by Terrence Terrell Moore. Jurors heard of the first of several admissions on Thursday from the man accused of killing a popular music producer in his Ferndale studio. 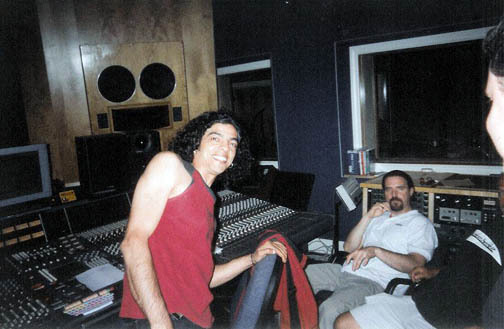 As Amjed “A.J.” Abdallah lay dying on the floor of the control room of his Ferndale recording studio, shot six times, his assailant worked diligently to disconnect wires from an expensive mixing board, a prosecutor said Tuesday in his opening statements in the murder trial of the accused assailant. Jurors will be allowed to hear statements given to police by a man accused of gunning down a music producer in Ferndale, a judge ruled Monday just as the man’s trial was getting under way. FERNDALE — A written confession and pawn shop testimony took center stage Wednesday in the preliminary examination of accused killer Terrance Moore. Moore, 36, was bound over for trial to Circuit Court on eight felonies, including first-degree murder, for allegedly shooting to death the owner of a Ferndale recording studio. FERNDALE, Mich. (AP) — A Detroit rapper charged with first-degree murder in the death of the owner of a recording studio is competent to stand trial, a judge ruled Thursday. Attorney Todd Fox had requested the competency hearing for 36-year-old Terrence Terrell Moore, who is charged in the January shooting of Amjed “AJ” Abdallah. A preliminary examination is scheduled for June 1 at 43rd District Court in Ferndale. Police say Moore, who also is known by the nicknames “13,” “TT,” and “Mad Dog,” shot Abdallah and stole a mixing board because he believed Abdallah was overcharging for studio time. Moore was arrested after a pawn shop owner in Detroit said Moore tried to pawn the mixing board for 5,000 dollars a few days after the murder, police said. Court security is weighing heavily on local judges’ minds. And they don’t have to look to Atlanta or Chicago to feel concerned. A Ferndale judge was threatened this week by an accused murderer who calls himself the 13th disciple of Jesus Christ and had the number “13″ tattooed on his forehead. “You hidden from me Joseph Longo and now your time has come because God had ordered your blood upon my hand,” wrote Terrence Terrell Moore in a letter to District Judge Joseph Longo. FERNDALE — An aspiring rapper accused of slaying the owner of a Ferndale recording studio is now being investigated for sending threatening letters to the judge and lead investigator in the case. Thank you! 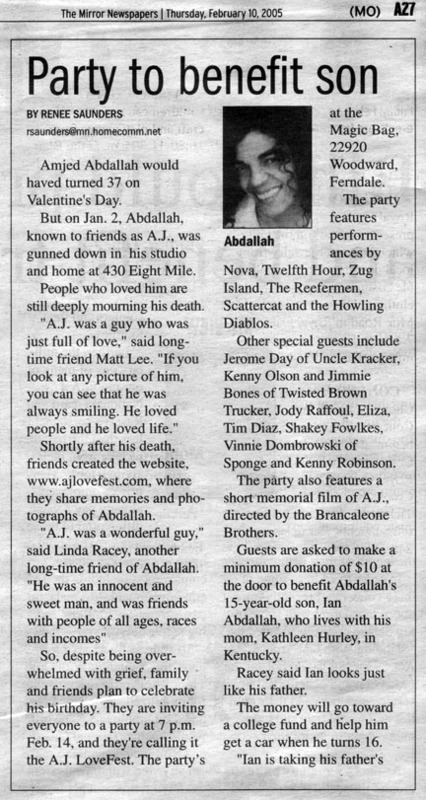 to each and everyone who walked through the doors at the Magic Bag for the AJ Lovefest on February 14th, AJ’s birthday. To say the least, What a success! An outpouring of generosity and love filled the room. 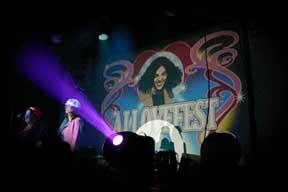 It felt as if AJ was there in spirit to turn the night into pure love and camaraderie. Many thanks to everyone who contributed, just to name a few: Jeremy of the Magic Bag for opening his theater to us, business owners who donated merchandise and gift certificates, publicity from the local media, the colorful belly dancers and Middle Eastern musicians who gave us an enlightening experience from AJ’s musical roots, his fellow musicians (who shared AJ’s passion for music) gave us the gift of a performance that would have certainly filled AJ with pride and happiness, a film dedicated to AJ (about his life here in Detroit) which truly captured the essence of who AJ was, his many friends who worked tirelessly to organize and coordinate this event, and the people who made generous donations for the benefit of Ian. The Friends of AJ would like to send a special thanks to Michael Spleet, an excellent digital photographer, for donating some amazing photos of the event. To see the photos, go to the Photos Page. The film, “ashes to ashes”, by the Brancaleone Brothers is now available on the Video Page. The courtroom seemed split in half during Terrence Moore’s preliminary exam. On one side, benches were filled with friends and family of the defendant, who police believe shot Amjed Abdallah four or five times with a Sig Sauer automatic handgun at his studio and home at 430 Eight Mile on January 2. 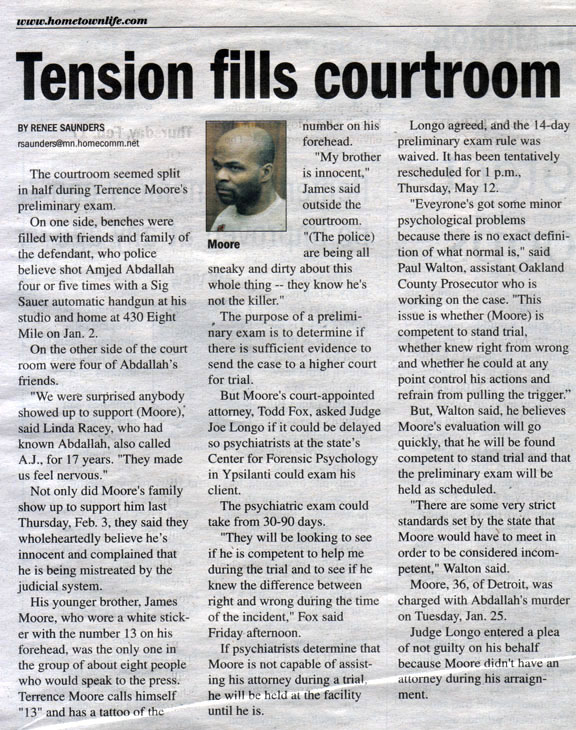 On the other side of the court room were four of Abdallah’s friends. Friends and fellow musicians are celebrating the spirit of AJ Abdallah, who was killed earlier this month in his Ferndale studio, with a celebration of his life as an equally talented musician and friend. The AJ Lovefest will be held Monday, February 14, Valentine’s Day, which also happens to be AJ’s birthday. This very special night will be a Detroit musical extravaganza and features unplugged performances by Nova, Twelfth Hour, Zug Island, The Reefermen, Scattercat and the Howling Diablos. Other guests appearing in special jam sessions include: Jerome Day of Uncle Kracker, Kenny Olson and Jimmie Bones of Twisted Brown Trucker, Jody Raffoul, Eliza, Tim Diaz, Shakey Fowlkes, Vinnie Dombrowski of Sponge and Kenny Robinson. The evening will also feature a short memorial film of AJ, directed by the Brancaleone Brothers. 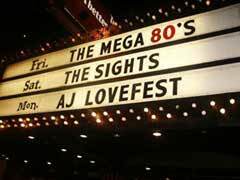 Come listen to the best Detroit musicians at the AJ Lovefest at the Magic Bag, Monday, February 14th, Valentines Day. Doors open at 7 p.m. and all proceeds from the minimum donation of for the event go to AJ’s 15 year old son, Ian Abdallah. Additional checks may be made out to Ian’s mother, Kathleen Hurley. The Magic Bag is located at 22920 Woodward Avenue in Ferndale. They can be reached at (248) 544-1991. The AJ Lovefest promises to be a beautiful celebration of a wonderful Detroit musician who will be deeply missed. Media may contact Matt Lee for Drumbeaters at (248) 584-3715. A man accused of fatally shooting a Ferndale recording studio owner was ordered to undergo a psychiatric examination to determine whether he is competent to stand trial. FERNDALE — Police spent Wednesday searching an SUV for evidence that may help them decide whether to charge a second suspect in the slaying of a Ferndale recording studio owner. Minutes before he was fatally shot, Ferndale recording studio owner Amjed “AJ” Abdallah was on the telephone with his brother in Jordan, telling him he was worried about two men coming to his studio to record rap music. FERNDALE — Authorities today expect to charge an aspiring Detroit rap singer in the slaying of Ferndale recording studio owner Amjed A. Abdallah. Amjed “A.J.” Abdallah came to the United States from Jordan 16 years ago with no money and few friends. But the 37-year-old had a dream. He wanted to be in the music business, helping artists record their songs. 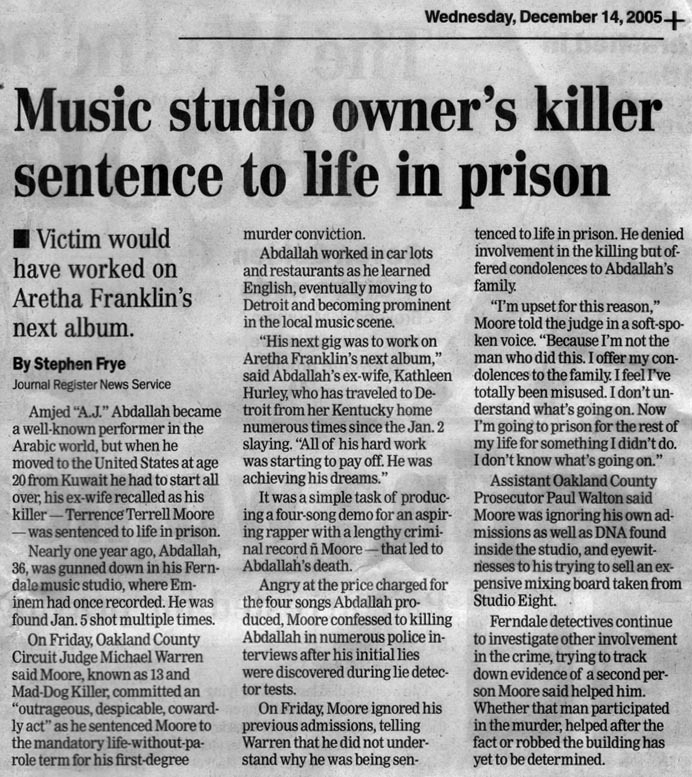 Abdallah died living that very dream in the Ferndale recording studio he bought a few years ago, shot and killed by someone the friendly, fun-loving man might have known.